There was a brief outreach meeting on 10 March - thanks for all who participated. We talked about many ideas for service to those around us. During Lent the group decided to focus on collecting TUNA, PEANUT BUTTER and BEANS. The Bangor Area Homeless Shelter has confirmed that protein sources are always in need. All donations of food are of course still welcome - but let’s make a special effort for TUNA, PEANUT BUTTER and BEANS. We will meet again on 07 April to discuss potential projects for the coming months. Stay tuned for other opportunities to contribute. On April 7th from 4 pm - 6:30 pm, Fr. 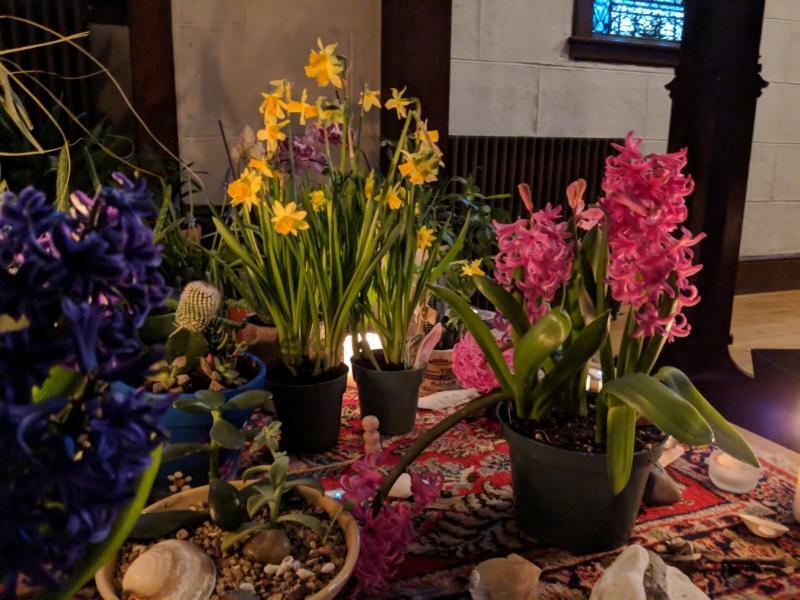 Jonathan Appleyard will lead a time of reflection and prayer, Come Away with me for a while, a Lenten quiet afternoon for members and friends of St. John's Episcopal Church. Please see the Lenten insert for more information. Extra help is needed for our monthly serving at Second Saturday, hosted here in the Undercroft. We are scheduled to serve next on April 13th from 11:30 am - 1:30 pm. No need to sign up in advance, or even commit to coming monthly, just stop in to help out when you can. For more information, please see Nancy Henry or Phil Ulrich or call the office at 947-0156. Extra help is needed for our monthly serving at the soup kitchen. We are scheduled to serve the fourth Tuesday of the month at the Salvation Army, from 10 am to 1:30 pm. Our next scheduled date is Tuesday, April 23. For more information, please see Nancy Henry or Phil Ulrich or call the office at 947-0156. Attention all knitters, the Prayer Shawl Knitting Group is meeting on Wednesday April 24th at 1 pm in the Parish House Oratory. All are welcome to join, both experienced and those who are looking to learn how to knit. Save the Date : Spring Rummage Sale Saturday, April 27 - Mark your calendar to volunteer on set up days (Wed, Thur, Fri, and sale day). Start saving/sorting items to donate (clothes, household items, linens, toys, books, jewelry). Any questions see Claudia/Jim Blanchette or Nancy Henry. The Parish Office will be closed the week of April 22nd, reopening on April 29th. Save the Date: Parish Family, please plan to join us for a special Easter Brunch on April 28th, the 2nd Sunday of Easter following the 10 am service. CLICK HERE for EVEN MORE Upcoming Events at St. John's! “Quo Vadis?” Where are you going? These are words that are famous in Rome. I hadn’t heard them before my sabbatical there, nor was I familiar with the story they tell. In Rome however I learned that people remember a time when St. Peter was discouraged about his ministry and authorities were becoming more aggressive toward him. Peter decided to leave. He began walking away from the city. He was well beyond its walls and walking on the Appian Way, an ancient 4th century BC road that leads to Southern Italy. As he walked, he saw Jesus, walking toward him on the road ready even to pass him. Peter stopped him and asked, “Where are you going, Lord?,” - “Quo Vadis?,” in Latin. Jesus answers Peter to say that he is going to Rome to be crucified again. Peter must choose - which way will he go? Will he continue on his path away from the city and the pain, disappointment, and danger? Or will he turn and go with Jesus? Peter had denied him in Jerusalem. He’d let fear grab hold of his heart and soul and determine his actions. Here was an opportunity to choose differently - and he does. This time his desire to be with Jesus - to stay with Jesus, to go with Jesus wherever he may go - overwhelms his fears, and he turns and walks with Jesus back to Rome. In Rome, of course, Peter meets his end. He is captured and condemned, and is crucified. He begs the authorities, not to escape death, but to be crucified upside-down so that he may not presume to die in the same way Jesus did. In Rome people remember the story when they see the small “Quo Vadis” church by the road. 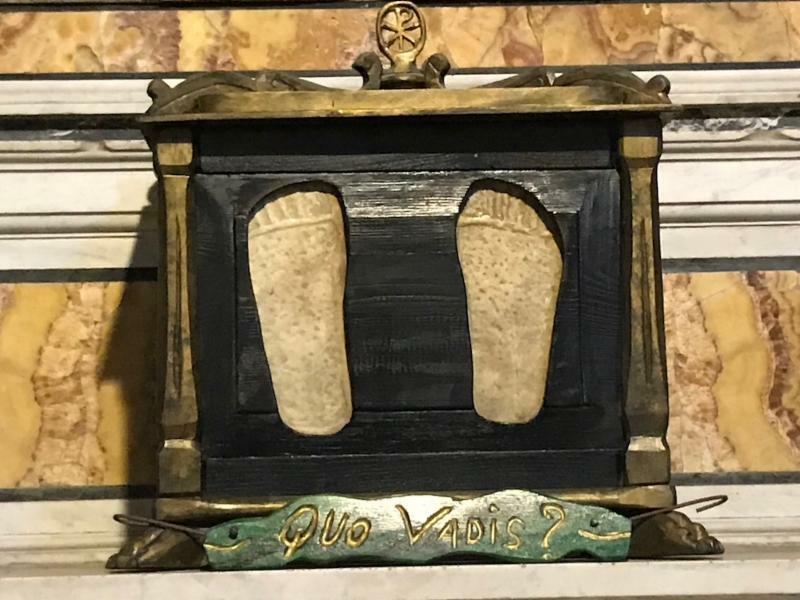 They remember it when they see stones like the ones in this picture that are said to be footprints Jesus left when he stopped and spoke with Peter. I imagine the story is remembered too when we feel we’re going the wrong way, or when we sense God leading us in another direction. And I suspect the story comes to mind every year as Holy Week approaches. Holy Week begins with Palm Sunday, this year April 14. Jesus has turned his face toward Jerusalem and he invites us to go with him. We will mark his triumphal entry (when he was greeted by the crowds and hailed like a king) with our procession of the palms at both our 8am and 10am services on that day. Our service then will turn toward the events of Jerusalem with our reading in parts of the Passion Gospel. And the events leading to the crucifixion and burial of Jesus will be remembered in Holy Week, with services each day and especially with our 7pm Triduum services, the holy three days of Maundy Thursday, Good Friday, and the Easter Vigil, when Jesus passes through death to Resurrection life. And we’ll celebrate his resurrection again on Easter morning, April 21, at 8am and 10am, and for all of Eastertide - the 50 days that follow and conclude with Pentecost. Our parish Easter Brunch will again be on the 2nd Sunday of Easter, April 28 following our 10am service. Holy Week, as Jesus enters Jerusalem to face his cross, he invites us to travel with him. He asks us to stay with him, just as he asks his disciples to stay and pray with him in the Garden of Gethsemane. The world around us doesn’t stop, and it doesn’t make room for remembering Jesus or going with him. Still Jesus goes on, and like Peter we have to choose our direction. Will we turn to stay with him and go with him? Each year we choose anew, and like Peter in Rome, we might find that we choose differently than before. This year may God grant us grace to stay with him through the events of Holy Week, that we may be ever more ready to greet him with Easter joy. Then like Peter we will no longer be asking “Quo Vadis, Lord?”, because instead we will have become Jesus’ companions on the Way. I look forward to making our journey together. † Special morning Eucharists in the chapel during Holy Week. Monday, Tuesday and Wednesday (April 15th-17th) of Holy Week in the Church at 7:30 am. These services and the readings appointed provide time for reflection and pause. Services conclude by 8 am. † April 18th at 5:30 pm please join us for Children’s Maundy Thursday in the Undercroft. We will hear the story of the Last Supper, wash feet, share a simple meal and create the Garden of Repose in the Chapel. † “Love one Another” Maundy Thursday Service with foot washing and the stripping of the Altar – April 18th, at 7 pm . The name Maundy Thursday is derived from the Latin mandatum, which means “commandment,” a command of our Lord after he washes his disciples’ feet “to love one another as I have loved you.” Remembering Christ’s arrest and the disciples’ fleeing, the altar is stripped following communion while the choir sings. All leave in darkness. † “Could you not pray with me one hour?” Jesus asks his disciples. At the conclusion of Maundy Thursday the Sacrament is removed to Bethlehem Chapel to the Garden of Repose where “those who would but watch one hour” may gather in prayer for the Vigil. The Garden is created by our children and the Chapel will be open until 10 pm. † Good Friday, April 19th, 12 - 3 pm, Stations of the Cross. Be with us at St. John’s for all or part of this three-hour meditation on the Passion of Jesus Christ. The ancient service traces the route that Jesus took to the cross, in prayers, and scripture readings. Feel free to stay for all three hours, to sit or to walk the Stations hanging in our church, or to come and go as your schedule allows. † Kids and Families, mark your calendar for April 19th and join us at 5:30 pm for Good Friday Interactive Stations of the Cross. Children can come for an interactive Stations of the cross. † The Good Friday Liturgy, April 19th, 7 in the Church: The Veneration of the Cross . The cross has brought us our salvation and life. We gather Good Friday to mourn the death of Jesus, to confess our love and contrition, and to pray before his holy cross, and to receive the grace he offers. Blue cards of prayer or intention are found in this bulletin and may be prepared in advance and placed at the foot of the cross as an offering. † Please join us for Prayers & Meditation in the Church, Saturday April 20th at 9 am. Holy Saturday is a service of Sabbath rest when we remember Jesus in the tomb with a brief liturgy of the word and prayer. † Please join us for The Great Vigil of Easter Baptism & The First Eucharist of Easter at 7 pm, Saturday April 20th. We gather in darkness of the night on which Jesus rose from the dead. This service, one of the oldest of all liturgies, is unlike any other service in the year. It is the Christian Passover feast in which we celebrate the Passover of Jesus from death into life and our own Passover from death to life in Holy Baptism. A reception will follow in the Undercroft. † On Sunday, April 21st, the 8 am & 10 am Easter Morning Festal Eucharist will be held in the church. † Don’t forget that on Easter Morning, April 21st , following the 10 am service there will be a visit from the Easter Bunny and an Easter Egg hunt in the church. During Lent, we often think of suffering and loss. Many of us adhere to the practice of sacrificing by giving up something cherished or loved for the 40 days that lead to the celebration of the resurrection of Christ. In my practice, I have found that this “sacrifice” of giving up something does not really cause me to consider suffering, loss, or pain. Perhaps, I’m just not doing it right. A few years ago, I changed my practice of giving up something for Lent and began choosing weekly Lenten texts on which to ponder and meditate. These texts are meant to conger images of real, tangible suffering. My Holy Week Lenten text is by folk song writer Eliza Gilkyson. Gilkyson beautifully captures the pain, suffering, and sacrifice of the December 2004 Indonesian tsunami. Some 500 people killed, another 150 still missing. This text, lamenting the destruction that water can bring, would come to mean so much more only 8 short months later. On August 29, 2005, Hurricane Katrina came barreling ashore, its eye centered on Waveland, Mississippi. As a Mississippi native, living in Alabama at the time, I had family directly impacted by the storm’s devastation. The center of Katrina’s eye came straight up Aiken Road in Waveland. My aunt BR and her partner, Beverly, lived (and still live there today) on Aiken Road. They lost everything. There was so much destruction and devastation, when they did return to see the damage, they were had to use Army Corps of Engineers GPS to locate the lot on which their house once stood. Nothing was recognizable. I cannot image that level of loss, pain, and suffering. In September of 2005, Gilkyson re-released her folk song; this time for those affected by Katrina’s wrath. Her text makes suffering real. We hear the angst, the pleading of those who have lost everything. It is my hope and prayer that that is a level of suffering I can never truly understand. During Lent, may we contemplate true suffering. May we empathize with acute pain. May we find solace in a God who “find[s] us when we’ve fallen out of grace.” May we find comfort as that same God “carr[ies] us in [God’s] embrace. Spring is a newness of heart. The dropping away of the old. My Spring is your Spring. Come alive and bloom for everyone to enjoy. As the beauty and fragrance of a rose. God never promised you a rose garden. The Children’s Chapel just completed a unit focusing on compassion, and since Lent begun, we’ve been focusing on the events on Holy Week in detail. We continue to pray together, learn together, and respond together with art or legos. We are also preparing to visit some of our homebound parishioners, and will be making non-slip socks for them and for some other elders in our community. Please join us with the puffy paint at coffee hour this coming Sunday, March 29. On Palm Sunday, our children lead the Hosannas and beginning of worship as we enter into this sacred time together. On Maundy Thursday at 5:30 we have our special children’s service. We listen to the story of the Last Supper, wash one another’s feet, eat a simple meal and bring plants and natural items together to make a garden of repose. On Good Friday, we will meet together for a simple, abbreviated Stations of the Cross. There will be baptisms to celebrate and bells to ring at the Great Vigil of Easter, and on Easter Sunday, there will be an egg hunt and special Bunny visit. We are hoping during Lent and Holy Week to enter more deeply into the stories and teachings of Jesus—this is an exciting, confusing, sad, and sacred time, full of mystery for all of us and especially for our youngest, to whom so much of the world is still a mystery. We hope that you will join us as we gather together to love each other, to question and to worship together. March 31: We will be making grippy socks to take to homebound members. At Coffee Hour. All are welcome! April 7: We will make short visits to our homebound members to deliver socks and spring greetings. 12-1 pm, meet in the Undercroft. All are welcome! April 19: Children’s Stations of the Cross, 5:30; location TBD. We need to borrow plants for our garden of repose on Maundy Thursday. Please bring your plants by Thursday morning or contact Anne-Marie to arrange for assistance with bringing them to church. Plants will be loved and available to bring home any time after Friday morning. Children and families, please bring a simple food to share for the Agape meal on Maundy Thursday. Please see Anne-Marie to sign up so we can have a variety of foods. Our Youth continue to gather on the second and fourth Sundays of the month. Our older group continues to focus on confirmation preparation, with recent topics including the Lords Prayer and the Nicene Creed. We meet with our mentors on fourth Sundays. We recently enjoyed a tubing trip to Hermon Mountain, and we worked hard to put on the St. Patrick’s Lunch. Many thanks to all who helped, especially Michael and Donna Demmons who cured the meat and helped us cook it. Our older youth assist at Second Saturday, while our younger youth have resumed trips to the Humane Society once a month. We hosted a vibrant diocesan youth gathering this past weekend. I am still sleepy but it was an amazing and energizing gathering. 19 teens and many adults gathered to learn and live the Way of Love. They volunteered at the homeless shelter and helped with some church chores, too. Many thanks to Alisa, Bella, Jim, Sarah and April who helped with cooking detail. 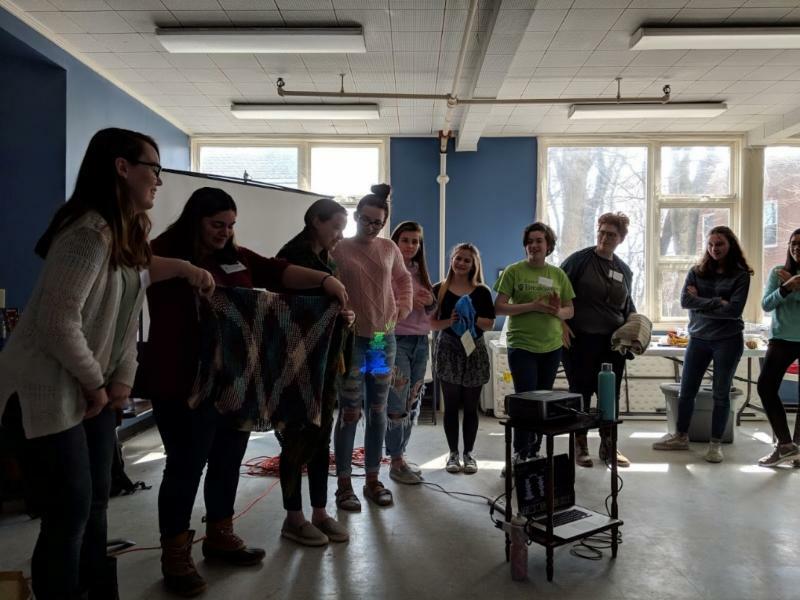 Seniors receiving prayer shawls at the end of the retreat. The above presentations and discussions all speak to the Great Commandment to love our God and our neighbor. In May we continue this theme with the year’s final Adult Education & Formation offering, a discussion of Waking Up White: and Finding Myself in the Story of Race (Debby Irving). A particularly valuable outcome of getting to know our neighbors is that by doing so we get to know ourselves better. Sharing our stories is an excellent start. Follow Irving as she explores her journey from complacency and cultural isolation to a growing awareness of the pervasive causes and effects of racism. This is not an easy topic for anyone in our society, but this book serves as a good conversation starter about racism, privilege, complacency, cultural assumptions and judgments, and ideas for our own journeys forward. “About this time I came across Edmund Burke’s quote “All that is necessary for evil to triumph is for good men to do nothing.” That’s me, I thought. I’ve been doing nothing. I hadn’t been doing nothing because I didn’t care or lacked the courage. I did nothing, at least nothing with any real impact, because I didn’t understand how racism worked. If you can’t see a problem for what it is, how can you step in and be a part of its solution, no matter how good a person you are?” Sundays in May (5 th , 12 th , 19 th , & 26 th ), 11:45 in the chapel.